1) Don’t linger and don’t snooze. This is probably the most difficult aspect of having to wake up in the morning. So many people snooze their alarm clock for an extra 5, 10 minutes of sleep, thinking that more sleep equals feeling better rested and more energized. It might seem like an an obvious choice, but in those 5-10 minutes of extra sleep, you barely get to fall back asleep, let alone get some rest. Because, in order to feel rested, refreshed and energized, you need to complete a full sleeping cycle. Thinking that snoozing your alarm and waking up every 5-10 minutes helps you feel more rested is a misconception since it takes 10 minutes or more to finish the first stage of non-REM sleep and waking up to the snoozed alarm clock interrupts your sleeping stage and will have you feeling like you’ve never actually slept. It is also likely to cause a bad disposition and feelings of tiredness because you feel like you didn’t actually sleep and want to rest more, to finish your stage of sleep. So if you want to wake up feeling more energized in the morning, don’t snooze your alarm or linger in bed. This is sure to wake you up and make you feel more invigorated, refreshed and alert. There is something called the ‘diving reflex’ which is essentially a reflex that is triggered when the face is submerged in water or when lots of water touches the face for several seconds. The forehead, eyes and nose have the highest density of receptors that trigger this reflex, so washing your face with cold water is sure to trigger the diving reflex. What happens is your heart rate slows down to less than 60 heartbeats per minute (bradycardia), you hold your breath (apnea) and blood vessels contract or shrink, resulting in elevated blood pressure. Blood flow is increased to the heart and brain, contributing to wakefulness, alertness afterwards. The temperature of the water is an important factor as the colder water is what contributes to the reflex. Also, the difference in your body temperature and the water temperature will create a sort of thermal shock and contribute to alertness. Essentially, if you wash you face with cold water soon after you wake up, you’ll be more mentally responsive, quick to react, perceptive and basically more energized in the morning. Waking up is bound to occur more easily and with greater enthusiasm if you know you’re going to eat something you really like. Good food is a great start to any day and just the excitement of a treat at the start of your day is enough to give you motivation to get out of bed. Whether it’s pancakes with maple syrup or your favorite honey variety, a soothing herbal tea or a fresh, creamy omelette, eating something you really like can contribute to a lively morning and put you in the right state of mind and have a good disposition for the rest of your day. Energy in the morning and the first half of your day is largely determined by what you have for breakfast, so make breakfast healthy. Remember the basics: you need protein for lasting energy and satiation, carbohydrates for quick energy and satiation too (think fiber) and a little fat to feed the brain. Some days you’ll feel like eating more of one of these macronutrients (protein, carbohydrates or fats) which is perfectly normal. But to make breakfast healthy, balance and quality are key. For example, it’s okay to have pancakes in the morning, but not out of a box. Make your own mix from fresh eggs, milk and flour. Top the pancakes with healthy choices like fresh fruits (strawberries, blueberries, banana) or nuts (almonds, walnuts, hazelnuts, cashew) with honey, if you are not allergic. See here lots of Honey Varieties. To get more lasting energy in the morning, you can have eggs, but try to make them free-range and enjoy them with wholegrain toast and maybe some avocado. You’ll get a complete protein profile from the eggs to support muscle and nervous system activity, Omega-3 and other fats from both the eggs and the avocado to feed the brain and lots of vitamins and minerals, especially iron, vitamin B9 and vitamin B12 from the eggs for a strong start to your day and lots of energy! To get more energy instantly, it’s a good idea to have some carbs in the morning. Wholegrain cereals, oatmeal provide relatively quick and lasting energy naturally, are rich in fiber for satiation and easier bowel movements, a good source of essential vitamins and minerals and they go great with both protein from milk, yogurt, kefir and fresh fruits and nuts to achieve a good balance in your eating. But whatever you do, don’t skip breakfast. Not eating in the morning will deprive your brain of nourishment and cause you to experience cloudy, foggy thinking, inability to concentrate and even bad mood as blood sugar levels drop. Unless you wake up to drink water at night, you’ll likely be at least slightly dehydrated when you wake up in the morning. Dehydration can make you will feel sluggish, lethargic, unmotivated, tired and cause stiff muscles and joints, drowsiness, bad disposition, headaches and low blood pressure. Drink at least half a glass of water when you wake up and try to get at least the same amount or, even better, one full glass of water in with your breakfast. Hydration can make a huge difference in terms of energy and give the right tone to your entire day. Coffee does give a boost of energy in the morning and it’s, well, natural energy instantly. But if you have coffee, wait until you’ve finished eating (so it doesn’t irritate the stomach lining) and had one, one and a half glasses of water to get you hydrated. Then you can enjoy a cup. After coffee, make sure you drink a big glass of water within the next hour to counteract its dehydrating effects. If you have tea in the morning, it’s great. But be mindful of the caffeine content of the tea. Green tea and, to a lesser extent, black and white tea, contain caffeine which will also dehydrate you slightly. Counteract the side effects of caffeine by drinking water after coffee and tea. Also see Coffee or Tea in the Morning: Which Is Healthier? If you have gastritis or acid reflux disease, it’s best to avoid some foods and beverages on an empty stomach if you want to have more energy in the morning. Citrus fruit (oranges, lemon, grapefruit, yuzu, lime) and the juices made from them and yogurt consumed by themselves on an empty stomach will likely irritate the stomach lining and deprive you of energy. Coffee and caffeinated teas are also bad for you on an empty stomach if you have gastritis or acid reflux. The best way to enjoy these foods without experiencing digestive upset is to eat them after breakfast and limit intake to small amounts. 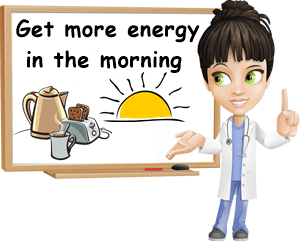 In the morning you can take magnesium, potassium and vitamin C supplements for more energy. Magnesium supports muscle activity and relieves muscle aches, soreness and stiffness for more fluid movements. It also has a calming effect. Potassium regulates blood pressure and, together with magnesium, helps you feel more rested and refreshed. Vitamin C acts as a natural antihistamine and can prevent lethargy, apathy, sleepiness and tiredness, all symptoms of pollen allergies or hay fever. Chocolate, especially dark chocolate, is a great morning food for energy. The cocoa in chocolate contains magnesium for muscles and the brain and helps relieve muscle soreness and stiffness and improves mood, helping you feel refreshed and more energized since the morning hours. Chocolate also contains caffeine and theobromine, both of which stimulate the heart and nervous system and contribute to alertness, mental responsiveness, combat fatigue and overall provide a boost in energy levels. Alternative: milk and turmeric. An alternative to chocolate, turmeric milk is one of those great morning foods for energy. You can add a pinch of fresh powder turmeric to a glass of warm milk or make golden milk by adding turmeric paste to milk. Learn more about the benefits and side effects of golden milk and how to make it in the article Properties and Benefits of Golden Milk. Some people prefer adding cinnamon to their milk or other spices. As long as it gives you the boost in energy you are looking for, it’s fine. Lastly, the best way to have more energy in the morning is to sleep well and this can be successfully achieved with the help of a sleeping schedule. Going to sleep at about the same time every night and waking up in the morning at about the same hour is one of the best things you can do for your health. Sufficient sleep, restful and undisturbed is the key to getting energy in the morning, naturally and instantly. Of course, it can take up to 2 weeks to get used to a sleeping schedule, so give it time. Also read my 7 Tips of Better Sleep at Night. A good night’s sleep combats fatigue, improves disposition, increases alertness, boosts memory and learning and increases productivity.